Lake County Auditor, John Petalas, has now made it possible to file for Property Tax Deductions without coming to the County Building. In the past, when a homeowner purchased or refinanced their home, they would require the homeowner to come to the Auditor’s office to file for exemptions. In the past, especially near the year end deadline, property owners might endure standing in line for hours in order to file. In Indiana there are a number of property tax deductions available to property owners. The most popular deductions for homeowners include Homestead exemptions as well as mortgage, Senior, and blind deductions. In addition, there are other exemptions available for vacant property, model homes, property renovation, and more, so it pays to check the list to see if you or your property qualifies. 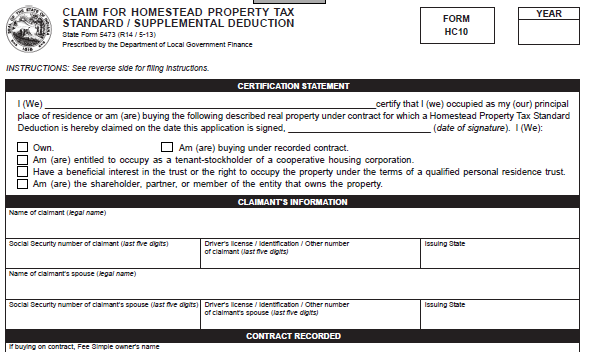 Residents of Lake County Indiana now have the option to file for homestead and mortgage deductions online, or by mail. This service is available through the county government website at www.lakecountyin.org On the County website there is a prominent link labeled “File Property Tax Deductions” at the top of the page. There you can complete the forms and file for your deduction. On the website there is a short video that explains the process. To file on line, you will be charged a $5.50 convenience fee, and will be required to have a driver’s license, a credit card, and a valid email address (you need this for confirmation, approval and receipt). Email notifications will be sent to the applicants when approved. As always, it is wise to save the confirmation of filing. Of course, homeowners still have the option to file in person at the county, or they can print the forms from the website and mail them to the auditor’s office at 2292 N Main Street, Crown Point IN 46307.